There's plenty of fireworks in this week's film noir. 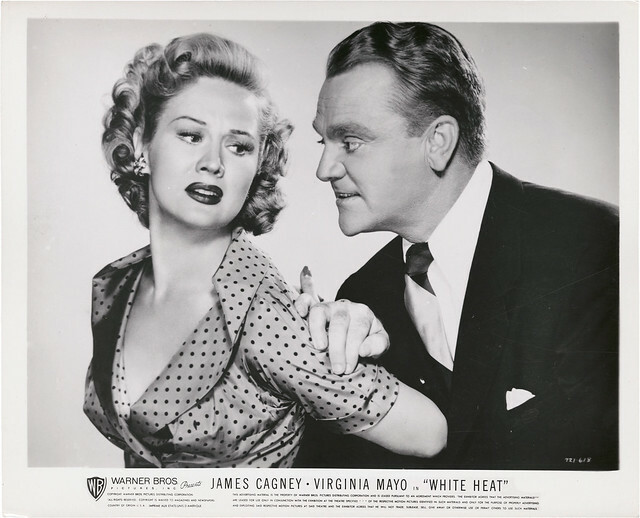 White Heat (1949), featuring James Cagney (above) as trigger-happy gangster Cody Jarrett, will air at 6 p.m. July 3 as part of TCM's film noir festival, Summer of Darkness. I'll outline the noir elements in this classic gangster movie below. White Heat (1949) is both a classic film noir, a classic gangster movie and a classic prison movie. Director Raoul Walsh and star James Cagney would make more films, but in many ways White Heat feels like a swan song for both men. Walsh would direct many good Westerns during the 1950s, but he turned away from the fast-paced and hard-hitting melodramas like The Roaring Twenties (1939) and High Sierra (1941) that helped define the Warner Bros. style. Cagney, along with Edward G. Robinson and George Raft, created the gangster archetype in the early 1930s. He returned to gangster roles a few more times after White Heat -- most memorably in a brilliant performance opposite Doris Day in Love Me or Leave Me (1955) -- but his portrayal of Cody Jarrett feels like a fond farewell to the genre that made him an icon. A vintage lobby card for White Heat (1949). White Heat tells the story of Jarrett, a psychopathic criminal who runs a ruthless gang of thugs along with his domineering mother (Margaret Wycherly). After Jarrett wounds a federal official (John Archer) in a shootout, he pleads guilty to a lesser charge and ends up in the Illinois State Penitentiary where an undercover agent (Edmond O'Brien) buddies up to Jarrett in order to learn the secrets of his criminal empire. Just a quick note: My analysis below contains spoilers. Genre style: White Heat is often classified as a film noir mostly because it was made in the late 1940s, which was the heyday of old Hollywood noirs. While the film does have noir elements --Virginia Mayo is a great femme fatale, Walsh provides some stylish cinematography, and you can't ask for a more psychollogically complex anti-hero than Cody -- in my opinion, it doesn't fit comfortably into the noir genre. 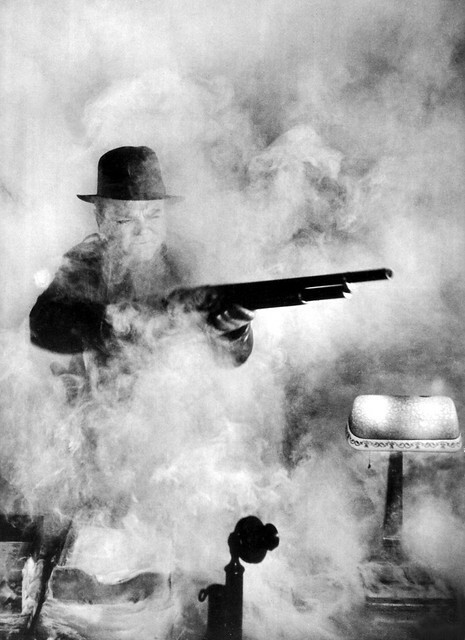 White Heat is more of an homage to the 1930s Warner Bros. style, especially the gangster and prison movies like The Roaring Twenties and Each Dawn I Die (1939), with a tip of the hat by both Walsh and Cagney to the new noir style. Walsh's directing style: There are two basic styles of films noir: documentary realism and formalism. The aim of documentary realism is to show life as it actually is: Walsh's own High Sierra is a classic of documentary realism. On the other hand, formalism alters reality through camera angles, editing and lighting: Last week's noir, The Third Man (1949), is a formalist masterpiece. Walsh is a pretty straight shooter throughout most of White Heat, especially in the scenes that depict the police surveillance techniques used on Jarrett and his gang. This was cutting edge technology in 1949; it's both fascinating and hilarious in 2015. Walsh does tip his hat to formalist techniques in the many night scenes, like this thrilling car-chase scene (above) through the neon-lit streets of Los Angeles, but he saves his most elaborate set piece for the (literally) explosive final scene. where Jarrett immolates himself on top of a huge gas storage tank while screaming, "Made it, Ma! Top of the world!" Cagney: Cody Jarrett is one of Cagney's great gangsters, another in a long line of ruthless, charismatic thugs that include Tom Powers in The Public Enemy (1931) and Rocky Sullivan in Angels with Dirty Faces (1938). Much like Walsh, Cagney responds to the film noir style by adding an extra twist to Cody's character. Method acting became wildly popular after World War II: John Garfield and Montgomery Clift were already huge stars, and Marlon Brando would make his movie debut in 1950. Cagney, who had no formal training as an actor, used method techniques without ever giving them a name. "I draw upon all that I've ever known, heard, seen, or remember," Cagney said when asked to explain his acting style. Cagney worked with screenwriters Ivan Goff and Ben Roberts to make the part more interesting, according to Cagney's autobiography. Cody's relationship with his mother was based on legendary gangsters Ma Barker and her boys, but Cagney wanted to make Cody a psychologically complex character who is almost completely dependent on his beloved "Ma." Cagney's crowning achievement is the scene in the prison cafeteria where he loses his mind after finding out that his mother is dead. There are a lot of legends about this scene -- depending on who's telling the story the other actors either didn't know what Cagney was going to do beforehand or they didn't realize how wild he was going to be once the cameras rolled. Either way, I don't think the horrified look on O'Brien's face was scripted. Fun fact: one of the prisoners whispering back and forth is the great American Indian athlete Jim Thorpe. Femme Fatale: White Heat gave Mayo one of her best roles, as Cody's spoiled, petulant wife, who always begs for a mink coat and two-times Cody with his right-hand man (Steve Cochran) while he's in prison. She's the perfect gangster's moll with her bright red lipstick and bleached blonde hair, and she's the recipient of one of Cagney's great come-on lines, "Grab the brass ring." If you missed TCM's airing of White Heat, you can catch it on DVD or video on demand.